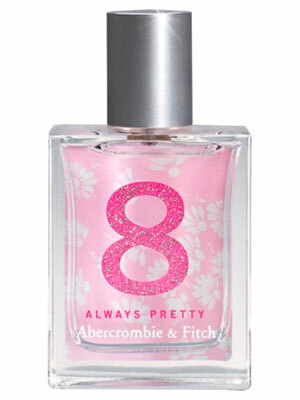 8 Always Pretty by Abercrombie & Fitch - A new limited edition floral woody fragrance for women with sweet and soft notes of sandalwood and amber, paired with magnolia and jasmine and a hint of apricot. This fresh floral feminine perfume launched in 2013 and is available from Abercrombie & Fitch stores nationwide. Package Design Clear square glass bottle with light pink floral graphic and sparkling pink 8 with a silver cap.